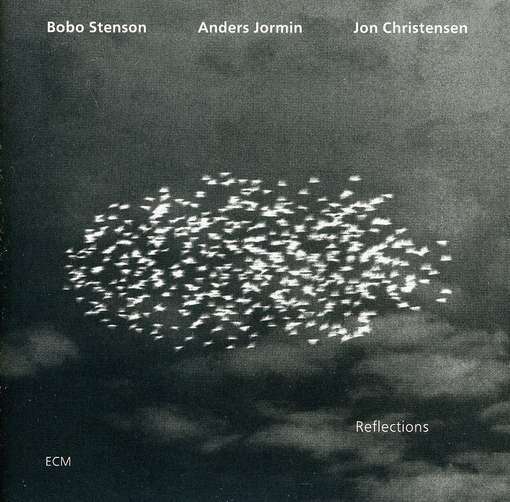 While not every cover photo necessarily gives insight into its album, the sleeve of the Bobo Stenson Trio’s Reflections reveals something at the heart of this music: light. The first time I laid eyes upon it, I swore I was looking at a flock of birds in the clouds. Closer inspection revealed, of course, one of the title’s more obvious meanings. If this little guessing game revealed anything to me, it was that what I was about to hear would feel the same: at once sky below and earth above. And where better to begin than in the leader-penned “The Enlightener,” which paints an aerial view of territories he will soon explore with long-lost brothers Anders Jormin (bass) and Jon Christensen (drums). Stenson keeps his left hand entrenched in a haunting monotone here, giving ample ground for the right’s erratic yet ever-purposeful flights, achieving somewhere along the way a transcendence one hears perhaps only in the Keith Jarrett Trio at its best. George Gershwin’s “My Man’s Gone Now” provides our first dip into the pool of standards. Like a bird jumping from branch to branch before finally settling where it will make its nest, Stenson binds drumsticks with bass strings and makes a home. His playing can thus be very dense at times, and to ensure that we don’t get pulled under, Jormin gives us a refreshing change of bass in two compositions. “NOT” opens with a lyrical gesture from Jormin against mere tracings of piano and cymbals before locking into a lumbering groove, which is mixed to bold consistency by a wider pianistic embrace. The agitated reverie of “Q,” however, sports the finest moment in the set in Jormin’s flowering solo. After the frothy runs of Stenson’s “Dörrmattan,” we are treated to a breathtaking rendition of Duke Ellington’s “Reflections in D.” Stenson treads almost stealthily here down a path of Tord Gustavsen-like balance, taking the tune to a cosmic level before closing with two more of his own: “12 Tones Old” (another bass vehicle in which notes crawl like spiders content in their webs) and “Mindiatyr.” This last is one of his most impressionistic, beginning in cascades supported by some lovely arco bass, which then hones itself into the buzzing exuberance of a spirit setting out on its first journey. Christensen’s enviable rhythm work plays us out alongside a Byzantine flourish from the keys. Listening to Stenson’s navigations is, I imagine, what a magician feels when fooled by another magician—which is to say that just when you think you know all the ins and outs of the craft, someone comes along and brings you back to the youthful joy that first lured you into it. One feels so much in everyone’s playing on Reflections, as if it were already living inside us and needed only six hands to give it voice. This date is a dream come true. Thank your lucky stars you can hear while awake. I’ve been waiting for you to get to the Stenson trio recordings. Brilliant review, as usual, for a brilliant record. Stenson’s playing is so intimate, it’s revelatory; He’s a fresh incarnation of Bill Evans, in a world of amazing pianists all owing heavily to Bill Evans. I can see why you skipped ahead to this release. Now, Tyran, if you’re not too busy — Serenity? Many thanks!